A lot of people like the household of the Nordic style, lines are clean, a lot of white and bright light, simple fashion style for you to create a simple but warm environment, bring the cold northern infinite warmth. In this summer, the outdoor furniture of art courtyard cannot be missed. Welcome Scandinavian design to your patio and garden! You find the perfect chair by trying them out. From our shop in Spain, you will find our various styles of chairs. We are looking forward to your choice. High quality material, fashionable style, you can find this garden furniture from Gardenart retail stores in France and Spain. A comfortable sofa is the most important piece of furniture in your living room. Low and linear, the chairs have a wide and deep seat for relaxed comfort. This fabric sofa set also comes with the dining chairs and stools, which you can find them in Gardenart stores in France and Spain. 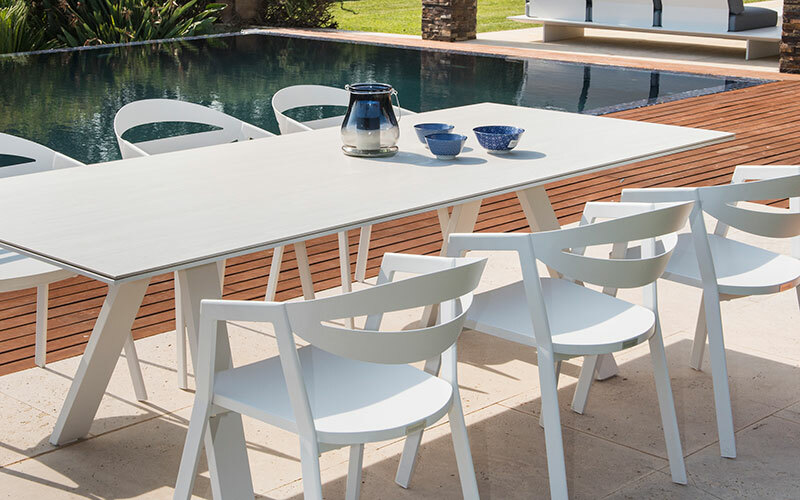 The simplicity design makes the table comfortably easy to fit chairs for social gatherings outside.